Heavy Fire: Special Operations was released on the WiiWare service on July 26, 2010. 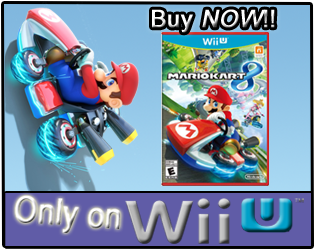 The game was developed and published by Teyon, andHF:SO can be downloaded for just 500 Wii Points. The game recevied an ESRB rating of "Teen" with content of "Blood, Violence" listed for gamers/parents to be aware of. How many hours have Wii owners spent battling in the "terrorized Middle East" with the missions in Heavy Fire: Special Operations? Let's take a look! 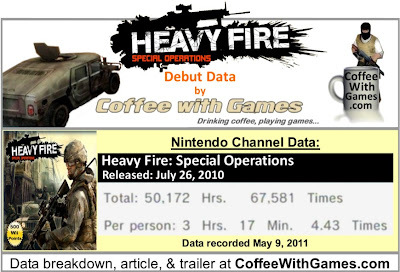 Heavy Fire: Special Operations has 15,255 Wii owners that have reported their play-time data, through the Wii's Nintendo Channel. HF:SO has 50,157 Total Hours of game-play reported for its debut, with an average play-time of 3 Hours 17 Minutes "Per person" having reported data. Heavy Fire: Special Operation has an average play-time per session of just over 44 minutes. Heavy Fire: Special Operations is currently sitting at the #13 spot in the WiiWare's "Popular Titles" section as of 12:20PM on May 10, 2011. The WiiWare "Popular Titles" section lists the most current twenty WiiWare games that are selling the best(I believe), making them the most popular. HF:SO's American WiiWare release has made Teyon about $76,275 before taxes, and before profit sharing with Nintendo; based on just the game's $5 price point and the approximate number of players having reported data. Heavy Fire: Special Operations' "professional" review score average is 33%, based on just 3 reviews on GameRankings.com. GameRankings.com only posts reviews from sites that submit/review a certain required number of games on a monthly basis, for a regular time. This means sites that don't try to get their reviews posted on GameRankings.com, or perhaps sites that don't meet the minimum requirements, will not have their reviews show up in the "professional" review score average for games. One site that reviews a good number of games, but that doesn't have their reviews posted on GameRankings.com, is Nintendo-Okie.com. Tony, from Nintendo-Okie, reviewed Heavy Fire: Special Operations last year after it released and he gave it a 3 out of 5 Stars rating, which would be almost double the "professional" review score average for the game. You can read Tony's review for Heavy Fire: Special Operations HERE. I don't know why, I just find it interesting that Heavy Fire: Special Operations had its debut the week after a certain "special operation" in the Middle East the prior week, took out one of the world's most wanted men. If you have not seen anything about Heavy Fire: Special Operations, the video below is a trailer Teyon put together when the game released last year. 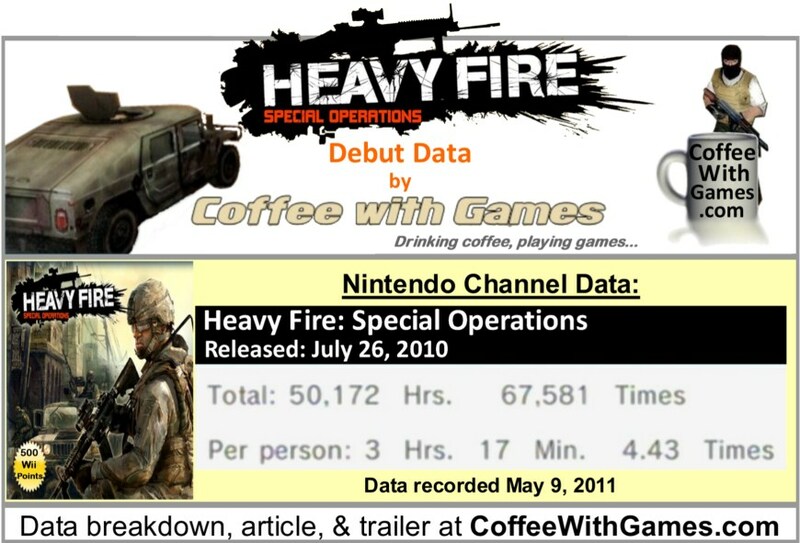 As for the data, Heavy Fire: Special Operations took 288 days from its release for game-play hours to debut on the Wii's Nintendo Channel. For a WiiWare game that was a new IP, debuting in less than a year is really good; especially when considering there are many retail Wii games that were released before HF:SO, that have not yet debuted. The average play-time per session being about 44 minutes I think shows the game provides an arcade type experience, that gamers can sit down with and play in short spells without investing hours at a time. The "professional" review scores for this game seem to follow in line with many successful retail Wii game reviews, like Just Dance; which is why I linked to Tony's review so you could read a differing opinion that was above the "average" review for the game. I have not played Heavy Fire: Special Operations, but I have been impressed with how Teyon seems to be promoting the game still with competitions, and promoting its WiiWare sequel Heavy Fire: Black Arms. Have any of you played Heavy Fire: Special Operations? If so, what do you think about the game? Do you feel the game is worth the $5 asking price, or should Wii owners perhaps look to its sequel instead, Heavy Fire: Black Arms? If you are interested in Heavy Fire: Special Operations, you can use a credit/debit card to purchase the game directly from the Wii's Shop Channel or you can use a Wii Points card which is linked/shown below. Only $80,000 huh? I guess this game would be pretty cheap to put together, but $80,000 only really pays a year's wages for two average staff people - it's not a huge amount. Then again, perhaps the game was successful in Europe. Goes to show how difficult turning a profit on 500 point games can be, huh? The thing to remember is this is based off just the players that report the data through the Nintendo Channel, and from the statistics I have looked at, it's only about 10-20% of Wii owners. Now, I would suspect more of those Wii owners are likely to purchase WiiWare games more often, so perhaps the percentage would be higher for the Shop Channel games, but probably not by a whole lot. Thanks for checking in! 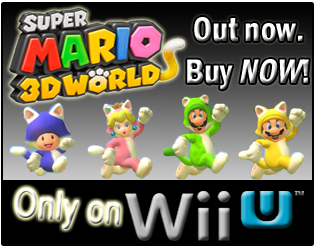 BTW, was this released in Australia?